Weary, scattered, worn, dusty and cinematic, just a few assertions made after succumbing oneself to a blast of Sam Morrow. Roadhouse country, brazen with an outlaw texture, edges a little closer to the core of CONCRETE AND MUD, eventually morphing into one of those records that you feel will shape the year. In other words, spawn a life of its own as it drives through the opposition like an orchestrated herd. This is the music of an exiled Texan, hooked up in the parts of the Golden State often left behind by the marketing men. Think Bakersfield, Steinbeck and underground LA, and you will soon get into the swing of this man’s music. Escaping similarities to a sound pitching somewhere between Waylon Jennings and Sturgill Simpson may appear shallow on the surface, but the challenge to deny is out there. Rucks of twangy guitar spiralling into sizzling solos lead the way, with steel and fiddle having fleeting moments. There is even a slight sound sidestep as this ten-track offering eases into its final throes, including shades of psychedelia in ‘Cigarettes’ and acoustic vibes in the temperate closer ‘Mississippi River’. However, it is earlier on when the soul of this album is really bared, probably most starkly when Morrow teams up with Jaime Wyatt for the steel infused duet ‘Skinny Elvis’. Both artists can now thank Forty Below Records for putting out their albums in the last year, and it is has been a double whammy in these independent releases being picked up by movers and shakers in the UK. You know there is a winner on the cards right from the start as album opening track and serious candidate for signature song, ‘Heartbreak Man’, provides more a furnace blast than sending smoke signals as to where this album is heading. ‘Paid by the Mile’ is a wishful thinking sentiment for a travelling musician and there are times when you feel this album has ploughed many of Route 66’s 2448 miles as it approaches the city limits of the City of Angels. Stellar country guitar decorates this track and so much of this thirty-nine minute ode to the antithesis of manufactured music. For some local references, ‘San Fernando Sunshine’ tells you probably more about the LA suburbs than ‘California Dreaming’ or ‘California Girls’, while who better than the Hag to namecheck when mentioning being let down by the bottle in ‘Quick Fix’. To get you in a foot shuffling mood, ‘Good Ole Days’ rattles along at a pace to ignite some movement, while always remaining true to a ‘good ole’ country rolling sound. It may have taken the steel as few tracks to punch above its weight, but it blows a hole in ‘Coming Home’, a slightly slower number deep in the album’s second half. The Sturgill association ramps up at this stage, with this being the album the Kentuckian might make when he heads back into the hills of HIGH TOP MOUNTAIN. It is though imperative at this stage to park the associations and praise the work of Sam Morrow. To leave a little room for improvement, ‘The Weight of the Stone’ is a murky mid-album detour with a whirly atmospheric sound replacing the driving beat and multiple twang. This song may well have its day, but at time of writing, it has some ground to make up on the album pacesetters. One stone cold assertion is that CONCRETE AND MUD enriches the country music scene, with its gilt-edged qualities shining through any perception of a dusty gloom. 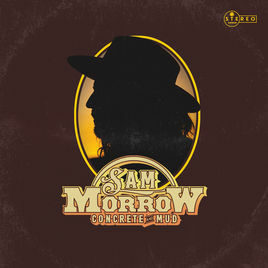 The rough diamond vocals of Sam Morrow add another edge to this album, establishing it as one to signpost that real country music is blossoming at the city limit marker. Also, continuing the fine heritage of loads of good music in the genre emanating from way out west.